at ORACLE Arena on December 18, 2015 in Oakland, California. NOTE TO USER: User expressly acknowledges and agrees that, by downloading and or using this photograph, User is consenting to the terms and conditions of the Getty Images License Agreement. On Dec. 11, the Bucks were the only team to beat Golden State this season. A week later, for roughly 40 minutes of play, they looked poised to do it again in Oracle Arena. 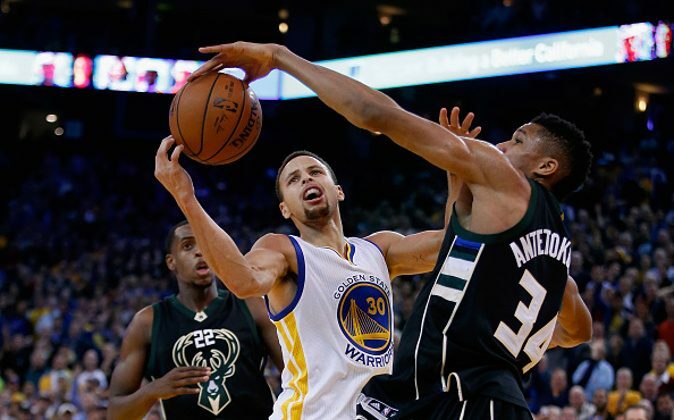 Of course, Golden State ultimately won the game 121–112 to improve to 26–1, while the Bucks dropped to a dismal 10–18. But it still stands that the Bucks have given the Warriors the most trouble this season. In the process of understanding why the Bucks match up so well against the Warriors, we uncover a potential blueprint for beating the Warriors. On defense, it’s clear what the Bucks were doing. The Warriors possess perhaps the greatest shooting backcourt in NBA history, so the Bucks put all their marbles into making sure those two didn’t get shots off. In the Bucks’ victory, they held Golden State to 6 three-point field goals—their lowest total of the year. In their second bout, Golden State was still held to 9 three-point field goals—tied for their third lowest total of the year. Basically, as soon as Klay Thompson or Stephen Curry have the ball off a screen, the Bucks double them without a moment’s hesitation, thereby forcing anyone but those two to make a play. Of course, the reason why the Warriors are so good is because they have so many ways to beat you. You can double Curry or Thompson, but in situations like these, the playmaking Draymond Green is a lethal option. After Green receives the outlet from a doubled Curry or Thompson, if he is very open, he is a more than capable three-point shooter. But more often, he will penetrate toward the rim. The defense is then forced to pick its poison—let Green advance to the rim or bring another defender over to help. In the case of the latter, Green then uses his superb court vision to find the player who is subsequently left open, often resulting in a three-pointer. Thus to prevent this second wave of offense run by Green, you need two things: a shot-blocking big man who can meet Green at the rim, and long, perimeter defenders who can provide intermediate help while also possessing the speed to close out shooters in a hurry. In terms of perimeter defenders, the Bucks have pretty much a prototype in Giannis Antetokounmpo. He was the big man they lacked versus the Warriors. With center Greg Monroe at less than a hundred percent, Monroe not only failed to protect the rim but was even a liability on defense, with the Warriors often picking on him on fast breaks. But in an ideal situation, if you have these two things—combined with running Curry and Thompson off the thee-point line—you have a pretty good shot at slowing the Warriors’ offense. But actually, even if things are done to this extent, it is nearly impossible to completely arrest the Warriors’ offensive machine. They will certainly get their points, so the purpose of defense is to limit the scoring as much as possible so as to give your offense an opportunity to outscore them. It’s almost puzzling how the Warriors have so much trouble defending the 10–18 Bucks, but the numbers are unmistakable. The Warriors scored 58 points in the first half of game 2, but still trailed at the half because the Bucks scored an unbelievable 70 points on 60 percent shooting. So how did they do this? While the Warriors’ offense can only be limited—not stopped, via defense, a surefire way to stop them is to not let them get the ball. In other words, by slowing the pace on offense, you limit the number of possessions the Warriors’ offense has. Accordingly, the Bucks are the fifth-slowest offense in the league, and versus the Warriors, we see that they often waited until late in the shot clock to make a move at the rim. The Bucks have amply shown that the Warriors’ second unit—a lineup often employed at the beginning of the second and fourth quarters consisting of guys like Iguodala, Ezeli, Barbosa, and Livingston, are very exploitable. Perhaps not having Harison Barnes has something to do with it, but the statistics in the two games are undeniable. In game 1, the Bucks outscored this unit 11–2 at the beginning of the fourth to turn a 3-point game into a 12-point lead and what eventually became a Bucks victory. In game 2, it was against this unit that the Bucks built and eventually opened up a 12-point league in the second quarter. Later in the fourth quarter, it was again against this unit that the Bucks opened up an 11-point game, forcing the Warriors’ starters to come back into the game early. The problem with this Warriors second unit is that they do not have any one guy who can consistently score or hit open shots. So if you just play solid defense and not let the offense execute, and on the other end you have go-to scorers—in the Bucks’ case, guys like Mayo and “Greek Freak,” you can gain quite an advantage on this unit. Because the Warriors play so small, they are susceptible to penetration on defense. This has long been known by the rest of the league. However, due to the quickness of the guards, the physicality of Green at power forward, and a good crop of shot-blocking centers featuring Andrew Bogut, Festus Ezeli, and even James McAdoo, the Warriors’ defense holds firm. So to exploit this defense, the Bucks have shown that you need physical, athletic players at every position who are well-versed in dribble penetration. Names like Michael Carter-Williams, Jabari Parker, and Giannis Antetokounmpo certainly fit the bill. Their damage is reflected most conspicuously in free-throw attempts. In the first half of game 2, the Bucks attempted a prolific 19 free throws. In particular, Stephen Curry’s defense can be highly suspect in certain matchups. This was most apparent in game 2, where the big, physical Carter-Williams was able pick apart and dribble by Curry at will en route to a season-high 24 points. Because this matchup was so much trouble, the Warriors even had to switch to putting Thompson on Carter-Williams toward the end of the game. Thus, while Curry has overcome his defensive deficiencies from when he first came into the league, we see that defense is still a glaring shortcoming of his in discussions on the league’s best player that pit him against perennial defenders like Lebron James, Chris Paul, and Anthony Davis. Penetration is the first condition. When you break into the lane, you are then sure to draw Festus Azeli, Bogut, or Green, which is why a versatile, scoring big man such as Greg Monroe is another essential element. In game 1, Monroe almost single-handedly crushed the Warriors’ defense in the fourth quarter; none of the Warrior bigs could defend him one-on-one. Posting up with a big man also has the dual effect of slowing the pace, a point we deemed important earlier. When the big man is not posting up, his job is then to stand by. As soon as one of the perimeter players gets into the lane and draws one of the Warrior frontcourt players, the big men are then left free to receive the pass and put it into the basket. Other times, the perimeter player may decide he has enough of a window to shoot. This opens up opportunities for offensive rebounds in the case of a miss, which in effect further keeps the Warriors’ offense off the ball. In other situations where one of the Warriors’ wing players are drawn, three-point shooters like Middleton and Mayo can then do their damage. So we see that the crux of the Bucks’ offense is penetrating into the lane and making smart decisions while in the lane. On Dec. 11 versus the Celtics, Draymond Green posted the elusive 5x5 statline. Here are the 5 players most likely to accomplish the feat next. NBA points scored versus points allowed graph. See which teams are prone to blowouts, shootouts, and slogfests, or are just plain losers.